How do I Remotely Connect from a Mac to another Mac via Remote Desktop? How do I connect a Mac computer to another Mac via remote desktop? All faculty, staff and students have the ability to connect via remote desktop. 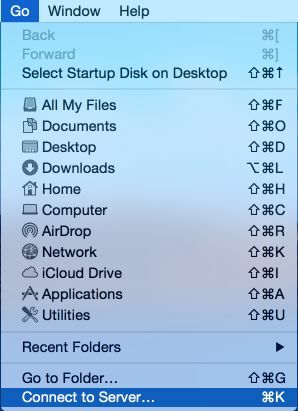 Open "System Preferences" by searching for it in the top right of your screen, and click on the "Sharing" icon. 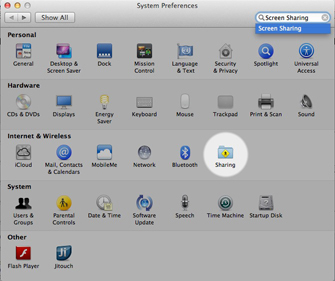 In the "Sharing" window, check the box for "Screen Sharing" and make sure the radio button for "All users" is selected. Next, make note of the IP address since you will be using it to connect from home. *Please note: Write down the IP address exactly as it is shown in Sharing Preferences. You will need to include rev.uncw.edu. In the blank box, type in "vnc://your ip address.rev.uncw.edu." Hit "Connect," and you will prompted for your UNCW user name and password. Put this info in, and you will have access to your work computer. *Please note: You need to connect to UNCW's VPN if you are attempting this off-campus. Check out this knowledge base article I found in the UNC Wilmington knowledge base. 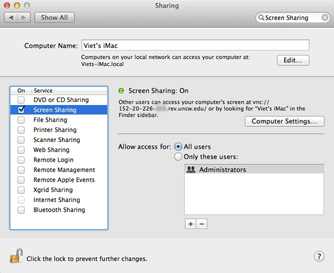 https://uncw.teamdynamix.com/TDClient/KB/ArticleDet?ID=11635 How do I Remotely Connect from a Mac to another Mac via Remote Desktop?